Toshiba Singapore Pte Ltd (TSP) is committed to meeting all requirements of e-Waste management regulations in the markets that we conduct our business. All our products are RoHS compliance and where possible are labelled with the WEEE symbol to remind the final user not to discard its product along with other household waste, but that it must be collected and treated separately. To encourage proper e-Waste management, TSP is committed to the collection, disposal or recycling of e-Waste. TSP will strive to provide an easy and environment-friendly way to its customers to dispose-off Toshiba branded products that have reached their end-of-life. This service is usually provided free of cost to the customers. 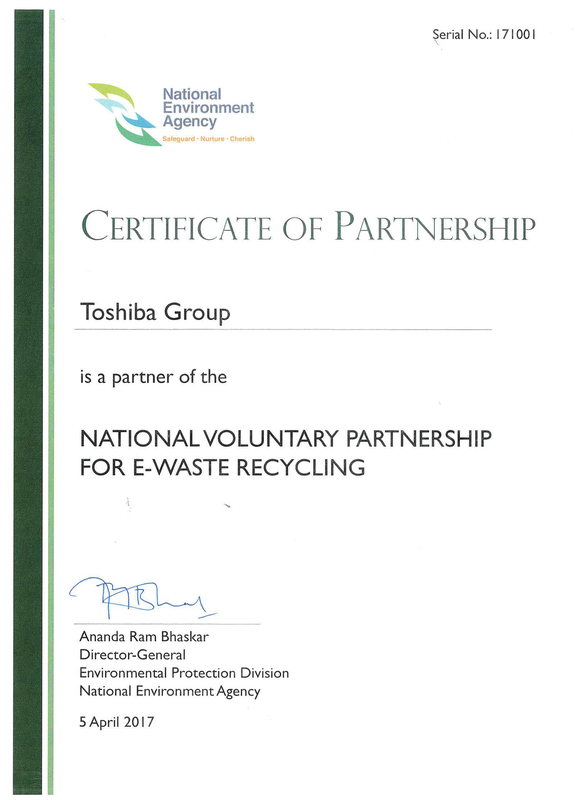 Toshiba Singapore Pte Ltd (TSP) is an active participant in protecting the environment. The company is recognized in the Honour Roll FY2011-FY2015 of the Garden City Fund, a registered charity and institution of Public Character established by the National Parks Board. The Garden City Fund conducts conservation, research, outreach and education on making Singapore a City in a Garden. Please call Toshiba e-Waste Call Centre at 1 800 200 6768 or send your email request to laptopcall@toshiba-india.com. Inform us of your intent to recycle your end-of-life Toshiba product. Toshiba Call Centre will arrange a pick-up of your end-of-life Toshiba product from your location. The end-of-life Toshiba product you intend to recycle can also be directly delivered at any of Toshiba’s collection centres/ collection points/ authorised recycler (refer to above link). Do not open/ repair the end-of-life Toshiba product. Do not sell the end-of-life Toshiba product to any unauthorized agency/ scrap dealers. Do not mix/ dispose the end-of-life Toshiba product with other household waste. Do not dispose the end-of-life Toshiba product in municipal waste bins. Do not keep the end-of-life Toshiba product exposed in open.